Master the Extensive Mind Powers in This Game with Our Comprehensive Guide! BradyGames' Psi-Ops: The Mindgate Conspiracy Official Strategy Guide includes a complete walkthrough of the entire game. All six Psi powers revealed. Expert boss strategies and tips to unlock every bonus mission. Detailed area maps, plus secrets and cheats. Psi-Ops: The Mindgate Conspiracy is an action/adventure game that utilizes traditional weapons combined with extensive Psi (mind) powers including: telekinesis, pyrokinesis, mind control, remote viewing, mind drain and aura view. Intense, fast-paced action with strategic decision-making and challenging puzzle elements. Eight huge and immersive levels spread throughout the world add to the intrigue and terrorist theme. Adaptive artificial intelligence makes enemies extremely aware of the player's actions and delivers more intense, realistic fighting. Multiple methods for solving missions. The non-linear design allows the gamer to conquer the mission in multiple ways, allowing for endless replay value. In addition to mind control powers, players have access to an arsenal of traditional weapons such as handguns, sniper rifles, flamethrowers, rocket launchers and grenades, which when combined with unique Psi powers, create an extraordinary and powerful game dynamic.Not Final Cover. Midway Games Inc. is a developer and publisher of interactive entertainment software. Midway videogames are available for play on videogame platforms including the PlayStation(r) 2 computer entertainment system, Xbox(tm) video game system from Microsoft, Nintendo GameCube(tm) and Game Boy(r) Advance. 1. Psi-Ops(tm): The Mindgate Conspiracy Official Strategy Guide (Official Strategy Guides) Farkas, Bart G.
Psi-Ops(tm): The Mindgate Conspiracy Official Strategy Guide (Official Strategy Guides) Farkas, Bart G.
4. 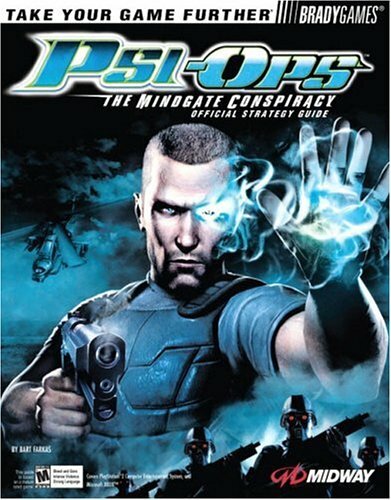 Psi-Ops(tm): The Mindgate Conspiracy Official Strategy Guide (Official Strategy Guides) Farkas, Bart G.